When I grow up I want to be happy. That takes a bit of practice, concentration and observation. At the first sight of grumpy wrinkles they are being straightened and the Great Canyon between the eyes is filled up again. Loud music helps a lot, as does dancing and eating. Of course. Yes: Food isn’t love… but still… it helps! If everything seems to be helpless there’s nothing better than a bomb of carbs that give you quite a serotonin boost. Happy, almost moronic, you start to grin again. You laugh at life and it’s sorrows and you feel as if you were invincible… almost like Batman. We all should feel like Batman way more often! Carbs sadly have a bit of a bad reputation. Especially in great amounts and even more so when it comes to pastry. Like croissants for example. 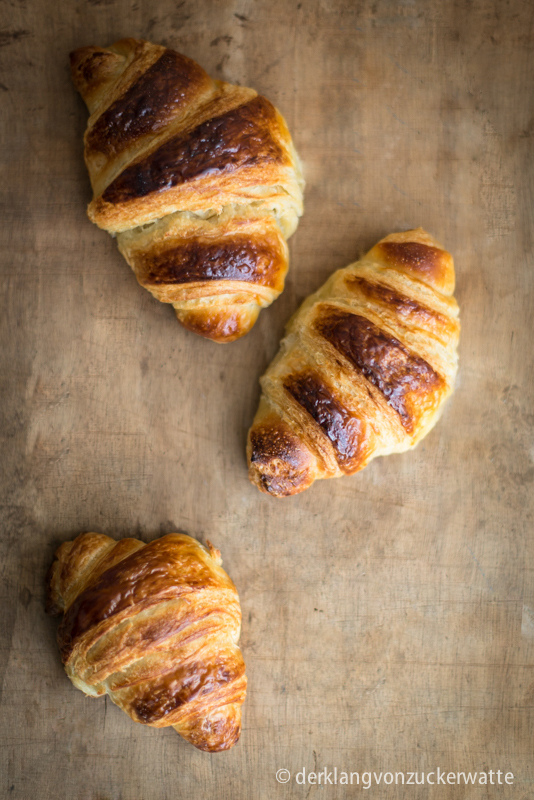 Warm, freshly baked, buttery croissants, that have a wonderful crispy texture on the outside and a heavenly smooth, creamy inside tend to give you such utter bliss, that you can just ask yourself why and how you could have survived so long without that precious feeling of brioche dough, crumbling apart on your palate. Of course I don’t tell you, you have to eat croissants to be happy or to be able to feel like Batman. But it helps. A lot! Nor do I tell you, that you have to make them from scratch. But trust me: It is so worth it. Really! And of course I don’t and won’t tell you, that you actually have to BE Batman to be able to bake these croissants. You can do it – even without the superman costume! And because life is way better without taking everything too seriously (but the actual amount of fat overruns every diet) we give a name to the butter plate. And since we’ve been talking about Batman anyway… say ‘hello‘ to Bruce! Btw: The recipe work perfectly without a kitchen machine, mixer or rolling pin. All you need is some cling film and your hands. And time. So let’s go! Mix together the ingredients for the sourdough. Also mix together the ingredients for the pre dough. Cover both containers and let them rest at room temperature for about 22 hours. Mix sourdough and pre dough, add the wheat flour and milk for the autolyse dough, cover the bowl and let it rest for 30 minutes. Add the yeast and the other ingredients for the main dough, knead until the dough is smooth. Let the covered bowl rest for 90 minutes and fold it halfway through and again at the end. Flatten out the dough with your hands until 1 cm thick to a size of about 25 cm to 40 cm. Wrap the dough with cling film as it is and put it into the fridge for 3 hours to cool it down completely. Get the butter out of the fridge until it is soft, then also put it between two sheets of cling film and flatten it out to one plate of about 25 cm x 25 cm and around half a cm thick. Put Bruce in its cling foil wrapping into the fridge as well. Get the dough and Bruce out of the fridge, unwrap them. Put Bruce edge to edge on the short side of the dough, fold the remaining third of the dough over Bruce and fold the Bruce-covered third over the previously folded dough… just like you would fold a letter. Now your “new” dough should have five layers: Dough – Bruce – dough – Bruce – dough. Flatten this out again to a 1 cm thick rectangle. Fold it again in thirds as before, wrap it again in cling foil and put it back into the fridge for one hour. Flatten out the Bruce-dough again, fold it again as before, put it back into the fridge for one hour and repeat the progress again for one last time. But this time let it rest in the fridge for 12 hours before proceeding further. Get the dough back out of the fridge and let it achieve room temperature (this will probably take one hour). Flatten it out one last time until the dough is 5 mm thick and about 35 cm x 45 cm big. Make a cut halfway-through on the long side, then cut both of the rectangles into thirds – again on the long side. Now make six diagonal cuts, one on each rectangle. You now have 12 long triangles. Loosely roll those 12 triangles up, from the bottom part to the top and place them (former tip down) onto tho baking trays with baking sheets. Mix the egg yolk with milk, sugar and salt and brush half of that mixture onto the 12 croissants. Let them rest openly for 2-3 hours. Preheat the oven to 240°C, brush the remaining egg mixture onto the croissants and put them, with a bit of steam added, into the oven. Bake for 5 minutes, then turn the temperature down to 200°C (it is a good idea to switch the baking trays now) and bake for 20 more minutes. 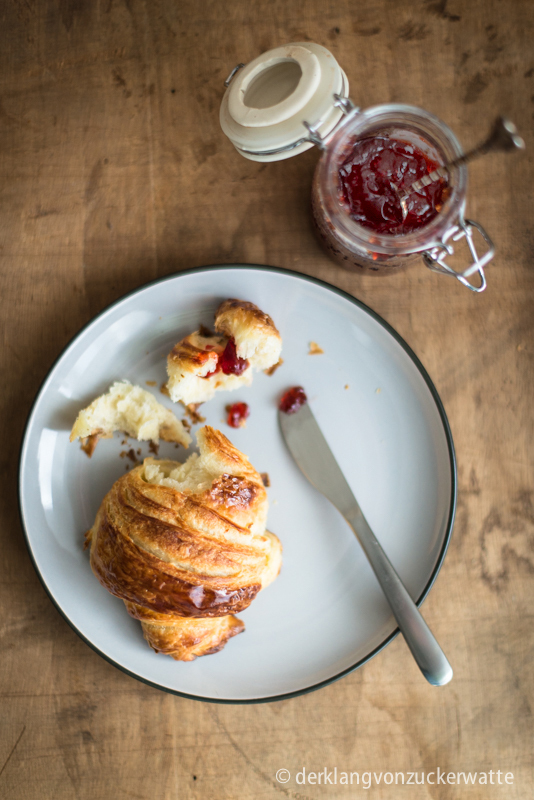 If you don’t plan to eat all the croissants in the next 48 hours you can bake them for 5 minutes less and put them into the freezer as soon as they are cooled down to room temperature. Put the frozen croissants into the preheated oven (200°C) for 12 minutes and they are almost as delicious as very freshly baked. Mix pre- and sourdough and let them rest.